(Bloomberg) -- Turkey joined a string of emerging-market central banks whose interest-rate decisions have surprised investors, tightening policy on Thursday for the third time in less than two months. The lira surged and the nation’s bonds rallied. The decision came three days after an inflation report showed consumer prices rose 12.15 percent in May from a year earlier, with the worst core reading on record and producer prices advancing more than 20 percent. A combination of a rising dollar, spiraling inflation, widening budget and current account deficits, and political pressure for lower rates spurred a flight from lira assets in May. 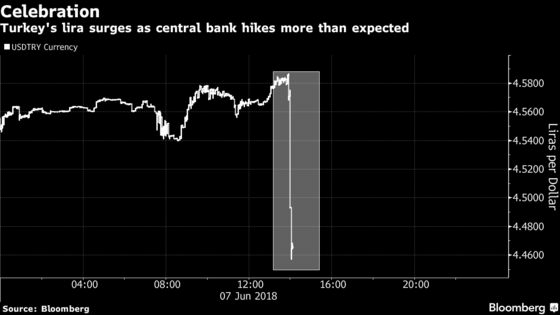 The central bank responded to the rout by first raising its late-liquidity window by 300 basis points at an unscheduled meeting, and then announcing a decision to to simplify its interest-rate regime, setting the one-week repurchase rate as its main funding tool. The bank didn’t publish any information on its other rates on Thursday, a move that seemed to be in line with its earlier announcement that it was simplifying policy. While Turkey has domestic challenges to contend with, other key emerging markets have also been hiking interest rates faster than investors anticipated in part because of a need to protect their economies against a rising dollar and outflows of capital as the U.S. Federal Reserve tightens monetary policy. India’s central bank this week raised its benchmark for the first time since 2014, joining peers in Indonesia, Mexico and Argentina. Brazil is also coming under pressure from investors. The lira rallied 1.9 percent to 4.4701 per dollar as of 3:00 p.m. in Istanbul. The yield on 10-year bonds reversed an earlier climb to slide 31 basis points to 14.9 percent after touching a record-high 15.41 percent on Wednesday. The Borsa Istanbul 100 Index rose 1.6 percent, with banking shares jumping as much as 3.4 percent.